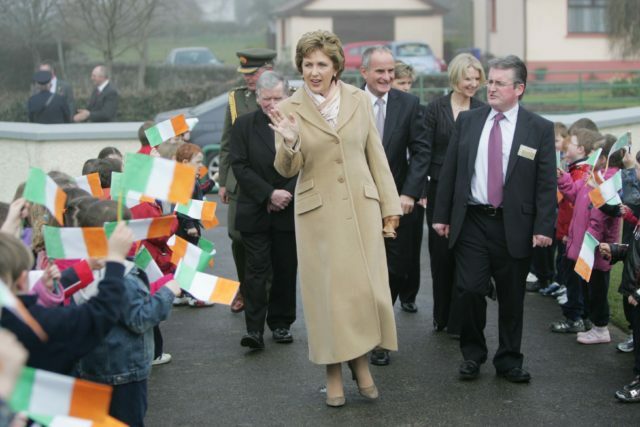 President Mary McAleese being met by infants on her arrival at Scoil Mhuire, Abbeyleix. Picture: Alf Harvey. This week we look back on a historic day for Scoil Mhuire, Abbeyleix when the president at the time, Mary McAleese, paid a visit to the school in March 2008. When President McAleese arrived at the primary school, she was greeted by the board of management chairperson, Fr Partrick Kehoe, as well as the school principal. The infants formed a guard of honour for the President as she walked to the main door. Mary McAleese was given a tour of the school and a short presentation on James Fintan Lalor by the 5th class pupils. The President then met the Green Schools Committee and had a meeting with some of the special education teachers afterwards. President McAleese was then shown the sensory garden. At the end of the tour of the school, McAleese and her husband, Dr Martin were officially greeted by the principal, Aidan McEvoy. Mr McEvoy spoke about the Brigidine Sisters and the Partrician Brothers who founded schools which amalgamated in 1983. McEvoy acknowledged the staff, board of management and parent’s committee in his speech. He also commended the pupils on the sense of joy they bring to the school. The pupils then sang ‘Abbeyleix’, lead by musical director John Hosey and singing director Mary Egan. After their fantastic performance, McAleese adressed the students. She asked them if the rumours were true that Scoil Mhuire was the best school in Ireland, to which she received an enthusiastic yes. The president then asked Mr McEvoy to cover his ears while she asked the pupils if they would like to have no homework for the evening. This question was answered with the loudest cheer of the day. She thanked the Patridan Brothers and the Brigidine Sisters for all they had done for education in Abbeyleix. She continued: “We heard in your song, what happens when someone leaves home, they feel lonely. They want a friend. Fr Kehoe continued: “We are fortunate enough to have such committed teachers, both religious and lay, and we are most grateful for their commitment. 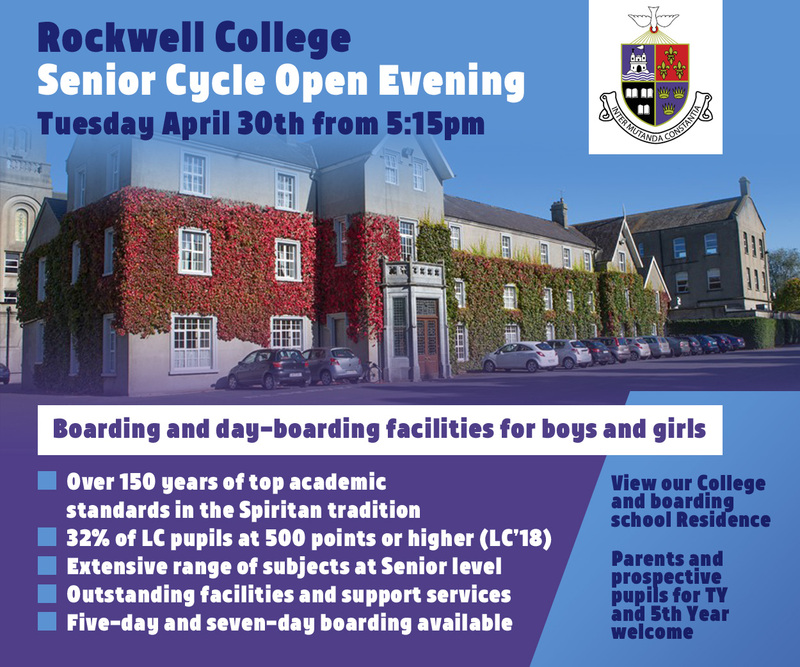 President McAleese was then invited to unveil a commemorative plaque celebrating the school’s silver jubilee. Two students, Caoimhe and Jack, then made a presentation to President Mary McAleese before she departed. President Mary McAleese meeting members of the green school committee at Scoil Mhuire, Abbeyleix. 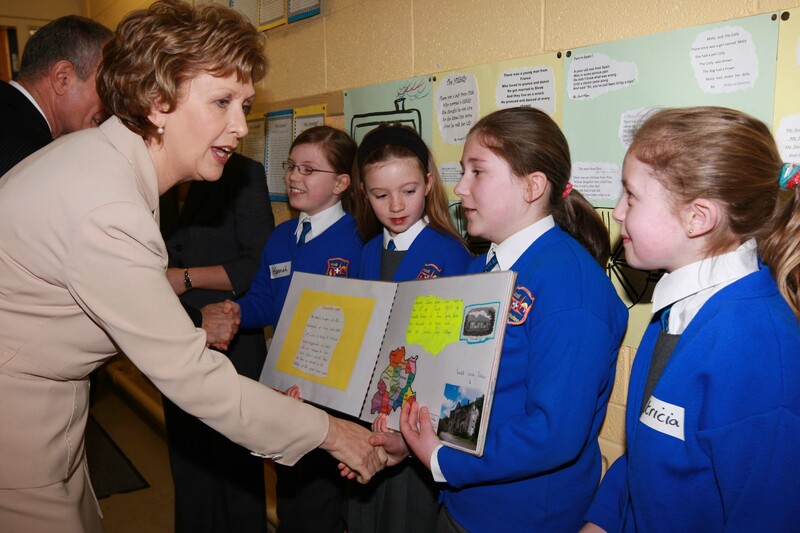 President Mary McAleese meeting children at Scoil Mhuire, Abbeyleix. 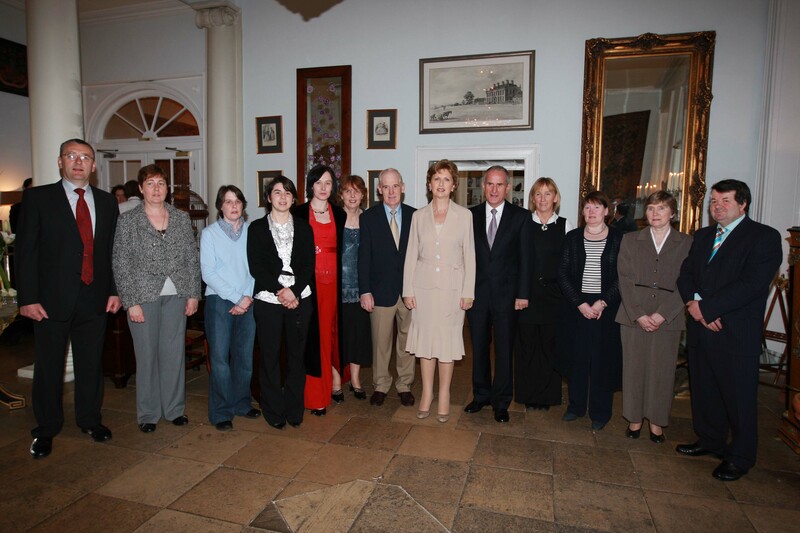 President Mary McAleese with members of Durrow Development Forum on her arrival at Castle Durrow. 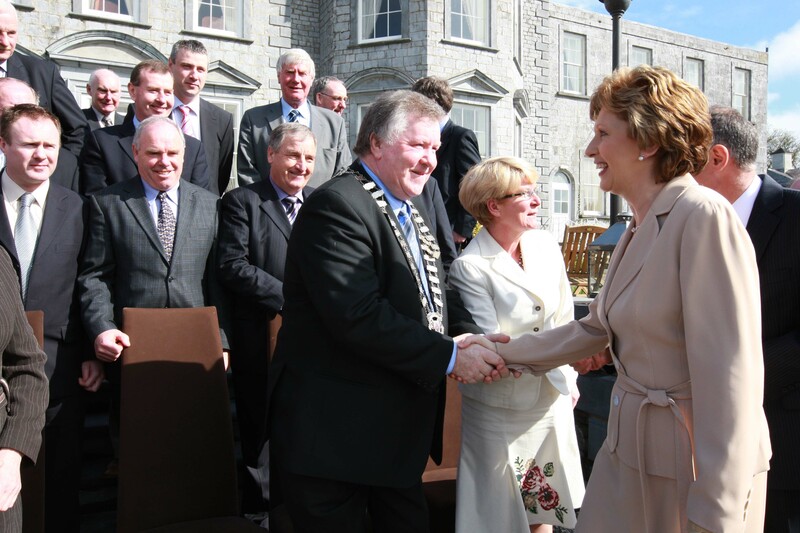 President Mary McAleese being greeted by Cathaoirleach of LCC John Moran MCC at Castle Durrow. President Mary McAleese being greeted children from Durrow and Cullohill National schools at Castle Durrow. President Mary McAleese being met by infants on her arrival at Scoil Mhuire, Abbeyleix.